Despite the advantages of Cambodia’s rice cultivation and growing tourism industry (thanks in large part to the Angkor site), the country is still one of the least developed in the world. More than two decades of civil war, especially under the Khmer Rouge regime, have ravaged the country’s infrastructure, decimated the population, and left behind painful memories. Agriculture is the biggest sector of employment, but agricultural production is still heavily affected by climate conditions and variability (flooding and drought). Smallholder livestock farming is hampered by infectious disease and is faced with strong competition from neighbouring countries. 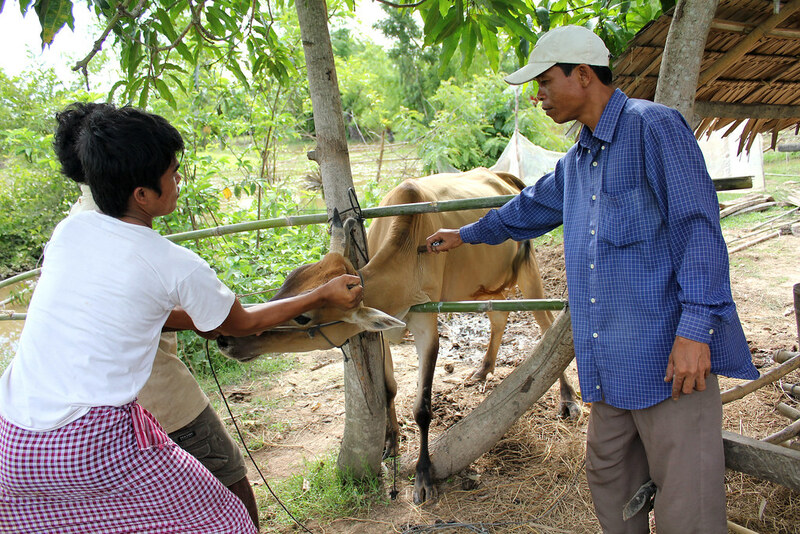 For more than 20 years, AVSF has been supporting farmers most affected by food insecurity and exclusion through concrete actions on animal husbandry, animal health, crop storage, access to water and income generating activities. AVSF is active in the provinces of Pursat, Kampong Chhnang, Kampong Speu, Takeo, Prey Veng and Svay Rieng. Support to smallholder families most affected by exclusion and food insecurity via concrete activities in livestock farming, animal health, crop storage, access to water. Training of village animal health agents to offer local veterinary services to smallholder families. These agents are now officially recognized by the government. Associations of veterinarian assistants were established to help ensure their continuation. Promotion of One Health: raising awareness on health risks, establishment of prevention measures to protect human and animal health, training on use and storage of medical waste and building infrastructure for the disposal of medical waste, rabies vaccination. Income-generating activities: reparation of small irrigation systems, creation of village rice banks, market gardening production, creation of small shops, small-scale processing, and the spreading of agro-ecological techniques. Area of intervention: Departments of Pursat, Kampong Chhnang, Kampong Speu, Takeo, Prey Veng and Svay Rieng. Training and refreshment of 2100 Community Animal Helath Workers (CAHWs) in 6 departments; establishment of 12 CAHWs cooperatives. Support to smallholder rice production and organisation of the value chain.